The Drexel University men’s and women’s swimming and diving teams had an outstanding performance at the Colonial Athletic Association Swimming and Diving Championships which were held Feb. 14-17 at the Christiansburg Aquatic Center in Christiansburg, Virginia. The women’s team entered the championships after four-straight wins against the University of Delaware Jan. 6, Towson University Jan. 13 (both of whom are members of the CAA conference), Seton Hall University Jan. 13 and Georgetown University Jan. 20. The men’s team entered the championships after an undefeated regular season. The women’s team finished in fifth place overall with a total score of 443 points, with the winning team from James Madison University scoring 656 total points. It was an amazing championship for the Drexel Dragons as they did not compete with a women’s diving team whereas JMU did. The men’s team finished in second place overall with a total score of 703 points behind the winners from the College of William & Mary, who scored 946 total points. Day One of the championships began Feb. 14 with preliminary rounds and then finals. The scheduled events were the men’s and women’s 200-yard medley relay, the men’s 1-meter dive and the men’s and women’s 800-yard freestyle relay. In the men’s 1-meter dive, sophomore Anthony Musciano was second after the preliminary round just behind Seth O’Dea from the University of North Carolina Wilmington. During the finals, Musciano put up a huge score of 277.45 to win. He was followed by senior Simon Carne who scored 265.80 for a silver medal. Musciano gained 20 points and Carne gained 17 points for the Dragons. Next up was the women’s 200-yard medley relay. After placing fourth during the preliminary round, the women’s team earned a silver medal in the finals. Sophomore Alexa Kutch, freshman Gabrielle Rudy, sophomore Hollie Hopf and sophomore Alicia Diaz competed for the Dragons. They earned the women’s team 34 points. The men’s 200-yard medley relay followed with a bronze medal finish. Sophomore Jason Arthur, junior Ralph Cannarozzi III, senior JT Lumpkin and freshman Kiran Richardson made up the team for this event. They added 32 points to the men’s team total for Day One. The men also earned a silver medal in the 800-yard freestyle relay from the team of sophomore Stathis Malamas, junior Patrick Cobb, junior Luke Hanner and Richardson for 34 more points. After Day One, the women’s team was in third place with 64 points, behind William & Mary who were leading with 72 points. The men’s team was in first place with 116 points ahead of UNCW with 91 points. Day Two began Feb. 15 with competitors lining up to race in the 500-yard freestyle, the 200-yard individual medley (IM), the 50-yard freestyle, the women’s 3-meter dive and the 200-yard freestyle relay. In the 500-yard freestyle, Cobb won gold for the men’s team with a time of 4:23.58 for 20 points and Kirmse earned a bronze medal for 16 points. In the 200-yard IM, Arthur took silver with a time of 1:45.99 just 0.23 seconds behind first place winner Jack Saunderson from Towson, who broke Arthur’s CAA-Meet and CAA-All-Time records for this event from 2017. This gave Arthur 17 points for the team. For the 200-yard freestyle relay, the men’s team of Malamas, Arthur, Cobb and Richardson posted a bronze medal with a time of 1:20.88 behind the first place time of 1:18.95 (a new CAA-Meet and CAA-All Time record). This gave the men’s team another 16 points for the day. After Day Two, the women’s team fell to fifth place with 152 total points, and JMU was leading with 231 points. The men’s team fell to second place with 233 points behind William & Mary with 299 points. Day Three began Feb. 16 with the following events: the 400-yard IM, the 100-yard butterfly, the 200-yard free, the 100-yard breaststroke, the 100-yard backstroke, the men’s 3-meter dive and the 400-yard medley relay. In the men’s 3-meter dive, Musciano won gold with a final score of 306.75 after finishing in fourth place after the preliminary round. Carne followed in fifth place. Musciano earned the team 20 points, and Carne, 14 points. The men also put forward gold and bronze in the 200-yard free. Malamas finished first with a time of 1:37.55 leading after prelims as well, and Cobb finished third with a time of 1:38.52. Another 20 points from Malamas and 16 from Cobb were added to the team’s total. In the women’s 100-yard breaststroke, Rudy placed second for a silver medal with a time of 1:01.78 just 0.11 seconds behind first place winner Jacalyn Schoening from Towson. The top three finishers were all within a second of each other for an exciting end. The men’s team took first and second in the 100-yard breaststroke. Cannarozzi swam a time of 54.86 for the win and junior Joseph Brown finished second with a time of 54.89. A small margin of 0.03 seconds for these two Dragons gave them a combined 37 points. The men’s and women’s teams grabbed gold medals in the 100-yard backstroke. For the women, Kutch and Diaz went one-two as Kutch set new CAA-Meet and CAA-All-Time records with a time of 52.99 breaking her own records from the 2017 championships. For the men, Arthur came away with a gold medal with a time of 48.10 just 0.14 seconds ahead of second place finisher Colin Demers of William & Mary. The Dragons finished Day Three with top three performances in the 400-yard medley relay. The women’s team of Kutch, Rudy, junior April Forsthoffer and Kirmse finished in second for a silver medal with a time of 3:42.35 behind the first place finishers from Northeastern University with a time of 3:40.26. The men’s team of Arthur, Cannarozzi, sophomore Joe Short and Malamas took bronze with a time of 3:14.72 behind the first place winners from William & Mary with a time of 3:13.29 (setting new CAA-Meet and CAA-All-Time records). After Day Three, the women’s team secured fifth place with 310 points, and JMU was leading with 418 points. The men’s team was in second place with 518 points behind William & Mary in first with 619 points. The final day of competition was held Feb. 17 with the last events: the 1650-yard free, the 200-yard back, the 100-yard free, the 200-yard breast, the 200-yard fly, the women’s 1-meter dive and the 400-yard free relay. The Dragons rounded out the last day with five golds and two silvers. The Dragons took first place in the 200-yard backstroke event. On the women’s side, Kutch won gold with a time of 1:54.23 setting new CAA-Meet and CAA-All-Time records. On the men’s side, Arthur claimed gold with a time of 1:44.37. In the men’s 100-yard free, Malamas won gold with a time of 44.19. The team went one-two in the 200-yard breast with Brown placing first with a time of 1:58.47 and Cannarozzi placing second with a time of 2:00.32. In the women’s 200-yard butterfly, Kirmse won gold with a time of 1:59.84 which was 0.08 seconds ahead of second place. An outstanding finish for another gold for the team. The men’s team concluded the day with a silver medal performance in the 400-yard freestyle relay. The team included Malamas, Arthur, Hanner and Richardson. Their time was 2:57.74 only a little over a second slower than the winning team from William & Mary who set new CAA-Meet and CAA-All-Time records for the event. A phenomenal performance by both the men’s and women’s teams brought home 12 team records, 56 top five performances and 76 top 10 performances overall. Four Dragons from the women’s team placed in the top 20 individually — Kutch ranked second with a total of 52 points for the championships, Kirmse tied for fourth with 50 points, Diaz tied for 15th with 39 points and Rudy tied for 17th with 37 points. On the men’s team, six Dragons placed in the top 20 individually. Arthur was ranked second with 57 points, Malamas and Cobb took fourth and fifth with 53 and 51 points, respectively, Brown tied for 11th with 43 points, Musciano (after winning both diving events) tied for 15th with 40 points and Cannarozzi was 20th with 37 points. 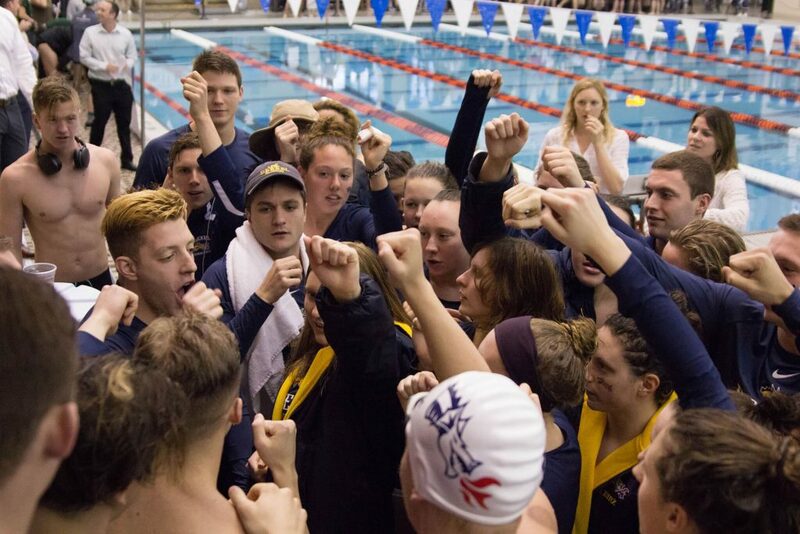 It was a brilliant and bittersweet end to a dominant season for the Drexel Dragons’ swimming and diving teams’ group of seniors, but there is no doubt that the upcoming classes will bring more success to this team and this school.